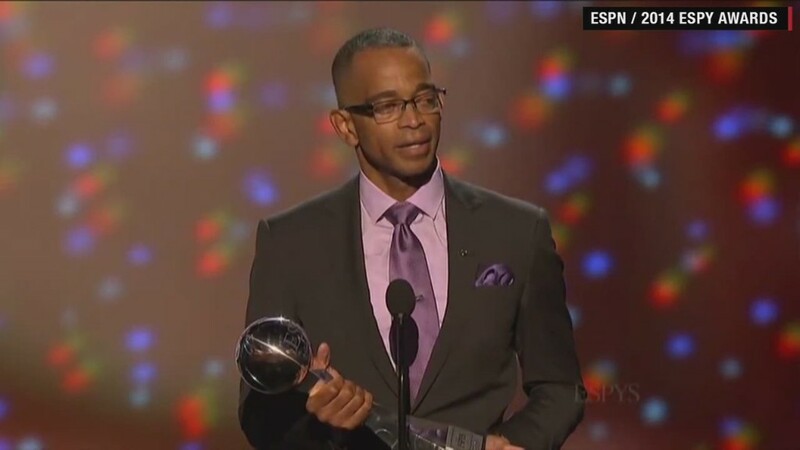 Stuart Scott was the sports broadcaster that an entire generation of aspiring reporters wanted to be. The veteran and energetic ESPN "SportsCenter" anchor has died after a years-long battle with cancer, the network said Sunday. Viewers may remember him for his trademark catchphrases, such as, "Boo-yah" ... "He's as cool as the other side of the pillow" ... "He must be butter because he's on a roll" ... and "See, what had happened was ..."
His first diagnosis came in November 2007, after he felt ill during a broadcast of "Monday Night Football," and ESPN said Scott "went through several surgeries, chemotherapy, radiation and clinical trials to stay strong and ward off cancer for as long as humanly possible." When the cancer -- "a very rare form called appendiceal cancer" -- returned a third time, he wrote, "To be honest, I'm scared." "I've always been afraid of cancer, but this time feels different. My confidence is shaken," he wrote in "Men's Health" in March 2013. Despite the cancer, he was resilient. "Here's what I do right (after) chemo. Leave the infusion center & go STRAIGHT 2 either do a p90x wkout or train MMA..THATS how you #LIVESTRONG," he posted online in January when he received a third diagnosis. Scott also found the strength to continue anchoring. He would frequently "lean back in his chair and relax during commercial breaks, often not hearing much of what his producer said," read a New York Times profile of Scott last spring. In November, Scott responded to rumors that he was in hospice: "Not True. Airball. Swing & a miss." Scott was remembered as a dedicated family man. He called his two daughters "my heartbeat." In September, he was in the hospital when his youngest started in her first high school varsity soccer game. "I DIDNT miss it," he posted online. "A friend I love ... FACETIMED me all game. Saw my daughtrs 3-goal "HATRICK" in a 3-1 win. I was cryin & yelling so ... Loud, nurses came in worried." That was the "best day I ever had in a hospital," he wrote. President Obama remembered Scott as a reliable presence in his life even when "public service and campaigns have kept me from my family." "I will miss Stuart Scott," Obama said in a statement. "Twenty years ago, Stu helped usher in a new way to talk about our favorite teams and the day's best plays. ... Over the years, he entertained us, and in the end, he inspired us -- with courage and love." On Sunday morning, there was an immediate outpouring of love and grief from Scott's longtime colleagues. ESPN's Rick Reilly wrote on Twitter that he was heartbroken: Scott "lived with such panache. He battled his disease with such dignity. Unforgettable man." Afternoon "SportsCenter" host Linda Cohn wrote, "I can't believe he is gone. There was nobody like Stuart Scott, There will never be again. A big presence with even a bigger heart." And ESPN President John Skipper praised Scott for "energetic and unwavering devotion to his family and to his work" throughout the ordeal. "When you die, that does not mean you lose to cancer," Scott said in his acceptance speech. "You beat cancer by how you live, why you live and in the manner in which you live. So live, live, fight like hell. And when you get too tired, lay down, rest and let someone else fight for you. "This whole fight, this journey, is not a solo venture. This is something that requires support." --CNNMoney's Brian Stelter contributed to this report.